There’s only two things I’m always wary about cooking in the kitchen, and to which I pay extra special attention. Number one: chicken. Number two: eggs. Food poisoning isn’t for the faint-hearted, and speaking from experience, should be avoided at all costs! Davidson’s Safest Choice Eggs take away the uncertainty involved when using eggs in dishes that might require them not to be fully cooked. Davidson’s eggs are pasteurized, which means they are gently heated to a certain temperature and held at that heat, until any harmful nasties desiring a home in your belly are destroyed. That’s right, they only use heat, so no chemicals or other strange Frankenstein science methods are used. 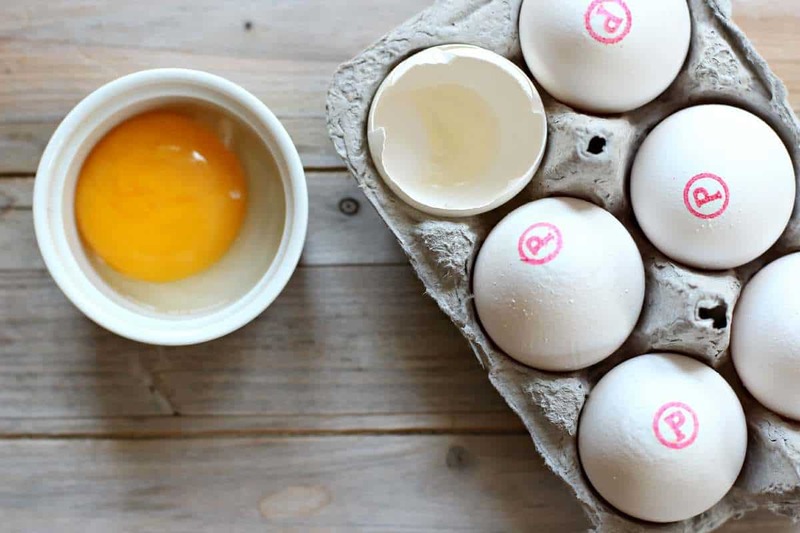 The U.S. Department of Agriculture requires all egg products to be pasteurized, but here’s where it can get confusing: this doesn’t mean eggs in their shell casing. It’s when the eggs are broken and turned into liquid egg, fillers or egg powder – then they need to be pasteurized. Most eggs for sale in the U.S. are not pasteurized and can potentially cause salmonella if eaten raw or are under-cooked. Safest Choice Eggs is hosting a competition on their Facebook page and would love for you to enter! All you have to do is create your own “no-bake” recipe using Safest Choice Eggs and win a grand prize worth over $5,000. It includes a trip to Florida and free eggs for a year! It’s an easy competition which requires no oven use. This is probably a good idea right now, as most of the country is in blistering heat so who’d want to turn on the oven anyway? Pasta is on my menu at least once a week like this amazing sausage pasta. This time I made one of my favorite pasta dishes, Spaghetti Carbonara, with a few of these eggs. Super simple and fast to make, it traditionally requires a raw egg plopped on top at the last moment but if you’re still a little wary of the yolk, just mix it through the warm pasta and take some of the rawness away. Add in some crispy pancetta, fresh thyme, and Parmesan, and your guests will be harassing you for seconds…or thirds. After making your own spaghetti carbonara, get your inner egg inspiration flowing. Safest Choice would like to give someone their very own $50 gift card – those nice egg people are making eggs safer and giving away cash! Just follow the Rafflecopter prompts and cross all fingers and toes. 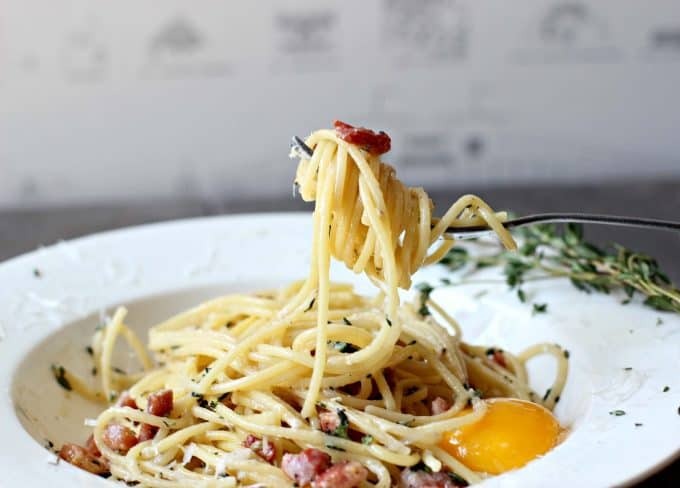 An Italian classic, Creamy Carbonara. Heat the olive oil in a pan, adding the garlic and the pancetta. Cook until the pancetta is crispy. Set aside. Separate the eggs putting the yolks in individual cups. Add the whites to a bowl and whisk in the milk and cheese. Season with salt and pepper. Drain the pasta and return it to the pot. Add the pancetta and the milk mixture to the pasta and mix thoroughly. The pasta will become nice and creamy due to the egg whites. Divide the pasta into four bowls trying to make a small nest on top. Top each bowl with an egg yolk. Carefully place it into the nest you made in the pasta. Grate some extra cheese on top and garnish with some fresh chopped thyme. That is one gorgeous plate of pasta. I LOVE carbonara. These sound like some great eggs and it is perfect since we love cookie dough a round here!! This carbonara looks awesome! I have never made my own before so I am excited about this recipe! I love any type of quiche. This looks spectacular! If there’s spaghetti carbonara on the menu, I am ordering it. Can’t wait to try this version at home! I love to make overnight breakfast casseroles. I make homemade egg mcmuffins for my family using whole wheat English muffins, Laughing Cow cheese, ham and of course the egg. Yummy! Your carbonara looks scrumptious, Gerry. This is so pretty and you too beautiful photos of this! Prettiest bowl of carbonara I’ve ever seen! Ooh, I’ve always wanted to try making pasta carbonara! Looks lovely. I really never get tired of a fried egg on toast. Runny yolk, of course. My favorite is Chili Rellenos. We also like scrambled eggs. my favorite dish to make with eggs is Farmer’s Casserole. My hubby loves it. I love making scrambled eggs! 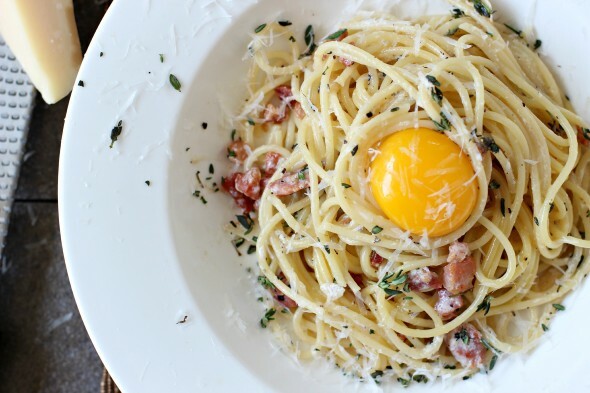 That egg perched on top of the pasta is just a PERFECT perfect perfect egg! Oh wow, this is looks amazing!! I am bookmarking this one! So glad I stumbled by your blog – I have always been reticent about eating uncooked eggs – so thank you for highlighting this brand! Man this is the best. When my wife and I first met we were doing a lot of long distance bike rides (100-150 miles) so we did a lot of carbo-loading and that made me fall in LOVE with carbonara. It’s my favorite. Fav egg dish is a homemade breakfast sandwich on an english muffin with ham and cheese! -salt only in the boiling water ( not too much). 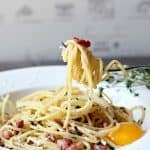 THIS IS “PASTA ALLA CARBONARA”. Neither peas nor cream nor other things like that. And if you do not know how to prepare, look at some Italian chefs.